January 15, 2014 marks the second time I've moved since I started the blog. 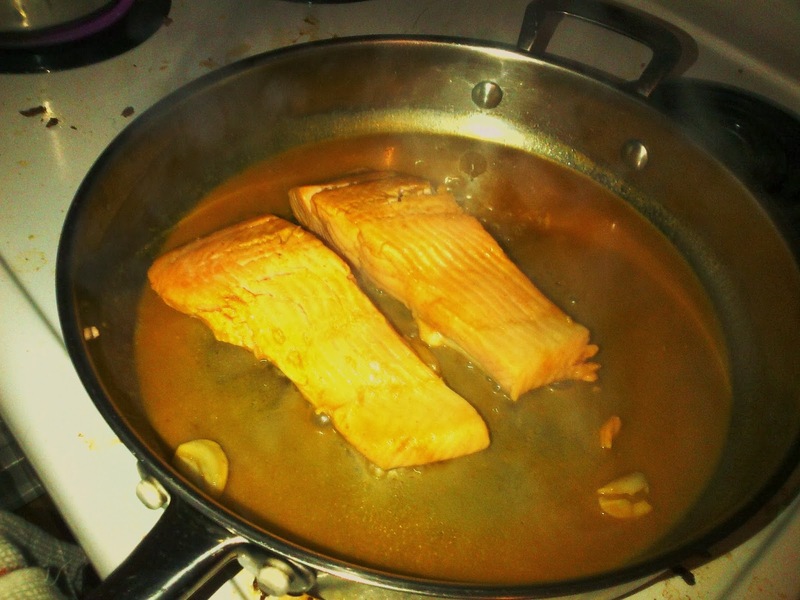 Back in 2011 I wrote a post about how cooking right after a move. Last time, we made quesadillas with just a knife and frying pan... and, y'know, cheese, sausage, tortillas and so on... This time, I kicked things up a bit more, using a few more tools and ingredients, but the point is the same: just because you're living out of boxes doesn't mean you have to eat crap or contant takeout. What's even better is when you move to a neighbourhood that has a number of amazing food shops. We moved right close to Wellington Street and are just a few blocks away from the corner of Wellington and Clarendon, which houses several wonderful shops, including Herb and Spice for produce (although they can be hit and miss), Saslove's for meat, Parma Ravioli for pasta, other Italian goodies and remarkably tasty pies, Three Tarts bakery for treats and the Ottawa Bagelshop and Deli for bagels as well as all kinds of fun gourmet foodstuffs. Needless to say, we've been eating well. But, for the first few days, we were pretty damn low on cooking implements and cobbling together a decent meal when you only can find a single frying pan and a spatula, if you're lucky, can be kind of difficult. So, with that in mind, we're going to take a look at the first week of eating at Novo Casa del Unicorn over the next couple of posts. - Wednesday: Moving Day! OK, no one should have to cook on Moving Day. With luck, you have access to a good restaurant in the nearby vicinity and can toddle off there, but if you're like me and have a little one, you can't just head out. Luckily we had Kari's mom who brought us a delicious lasagna and Caesar Salad. - Thursday: This was day one of living in the new neighbourhood and we found ourselves wandering to the local foodjobbers. We wanted to put together something simple and filling, so we made our way first to Saslove's to figure out some kind of meat. We settled on their sausages made with Beau's beer, but we didn't know where to find hot dog buns, so I thought "Well, we'll just cut the sausages in half and just serve 'em on kaisers." Turns out that cutting a sausage in half kind of ruins the casing and makes it more like a pile of ground beef. So, I came up with what I call "Sloppy Beau's": Basically it was a mix of sausage meat, beer, onions, chopped tomatoes, cheese and other stuff cooked in a frying pan and served on buns... I honestly don't remember how it came together, but it was easy and tasty! Alright, this is the first true "recipe" that I wanted to post. After two days of pretty heavy meals, I wanted to make something a lot lighter. After taking a stroll west to find foodstuffs, we now ventured eastwards to see what there was to find. We found a small fishmonger in our travels and I picked up a nice hunk of sockeye salmon. By this time we'd managed to uncover our box of oils, vinegars, cooking booze and whatnot. We were still missing most of our spices, but was able to uncover a shaker of Chinese 5-Spice Powder. Also, in preparation for cooking future meals, we'd brought all our fridge items in a couple of coolers on moving day, so at least we had juice and sauces and other fridge items with which to work. So, I put together a quick recipe for a sauce and decided to pan fry the fish while the sauce was cooking up on the side of the pan. We also happened to have a sweet potato and some edamame in the fridge and a bit of cilantro. It all came together on the fly, but that's how it goes a lot of the time. - Heat oil in large pan at about 6-7, add garlic and sauté for a minute or two, stirring frequently. - Place fish in the middle of the pan. This should displace the sauce to the side of the pan; this is a good thing! - Get the sauce boiling on the side, while occasionally spooning some onto the fish. Cook the fish skin side down for about 7-8 minutes. The fish will partly pan fry, partly steam from the sauce. - Carefully flip the fish over with a spatula and cook again for about 5 minutes. Flip back over and serve. You may want to discard the skin. I personally like the skin, but not everyone does. Top the fish with the rest of the sauce and serve with salad. Equal parts braising, pan frying and steaming - bryming? - Boil sweet potato until fork tender, but not mushy (about 10-15 minutes). Drain in a colander and cool with water. Drain well. - Peel edamame if necessary. 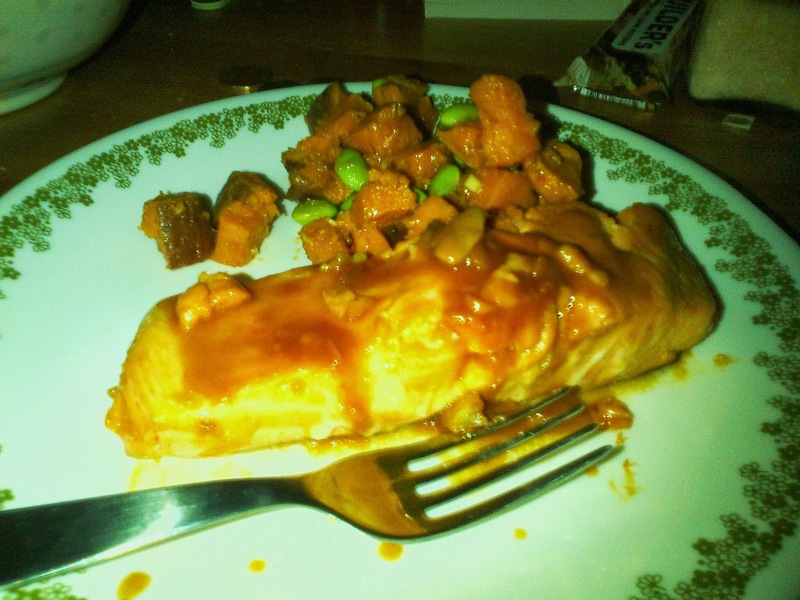 - Combine sweet potato, edamame and cilantro in a large bowl. - Whisk everything together and toss with salad and serve. The result was pretty darn tasty and very bright, not surprising considering how prominent the orange juice was in the sauce, spicy but not overpowering. The fish was a little bit overdone for my taste (salmon is supposed to rare in the middle), but that was mainly for Kari's benefit since she isn't a big fish eater, and really, even then it was tender and delicious. The salad also added a bit of richness to cut the acidity of the sauce, rounding out the dish very nicely. All in all, it was a great way to brighten up a cold winter's night and have a nice post-move dinner that isn't too difficult. We'll pick this up next time with meatballs, pizza and pot roast! It's wintertime in Canada, and in case you haven't heard, it's been pretty damn chilly since the end of November. And it's at this time of year that we pretty much NEED the kind of food that sticks to one's insides like tasty, edible spackle. Now, there are numerous cuisines that come from Northern climes and aren't always well-known or given their due in popular culture and food trends. I already blogged about one Czech comfort dish many moons ago, now I want to move to the northeast, to our friends in Russia. Russian (and by extension Ukranian, Lithuanian and some aspects of Polish) cuisine isn't exactly en vogue (has it ever been?) and yet it features utterly delicious, hearty and nourishing fare, well-suited for the climate in which it originates and in which the mighty Canuck lives. Now, this post happens to coincide with the Winter Olympics in Sochi, Russia, even though we made the meal back in late November (Xmas and moving were in between then and now, don't judge me!). This post is by no means a plug for the Olympics or for Russia itself, because they're a freakin' sh*tshow this year and should never have been awarded to such a repressive country as Russia. OK, getting back off my soapbox and back to the food. Because they do have tasty food. One of the stalwarts of Russian cuisine is Borscht. 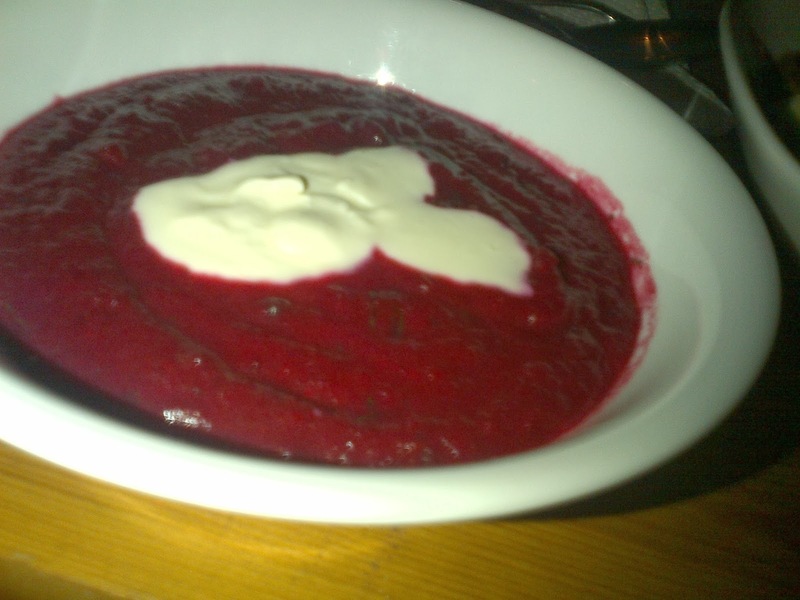 Borscht is a stew and/or soup (or "stoup" as my wife likes to call it) that is pretty much always based on beets. It comes in both hot and cold forms, and both are fairly well known. Now, root vegetables are always a favourite in the colder months. They keep for a fairly long time, they're hearty and they do a great job at thickening stews and soups, allowing you to make the "stick-to-your-ribs" goodness a body craves at this time of year. Beets have the added bonus of being delicious with a unique flavour profile no other vegetable can match. They're sweet, earthy and rich, not to mention versatile; you can use them as the base of a salad, slice and fry them into chips, pickle them, and so on. And, of course, make a whack of Borscht! I found this recipe for Borscht on the Internet thanks to Martha Stewart (don't judge me) and adapted it to my tastes and desires. - Preheat oven to 400 degrees Fahrenheit. 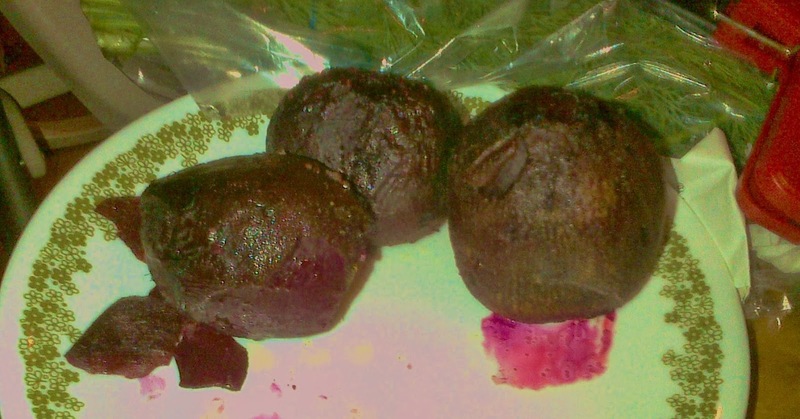 - Coat beets in vegetable oil and wrap tightly in foil. Please on baking sheet and roast for about an hour, until beets are tender (simply prick with a toothpick, if it goes through beets easily, they're done). Set aside until cool enough to handle. 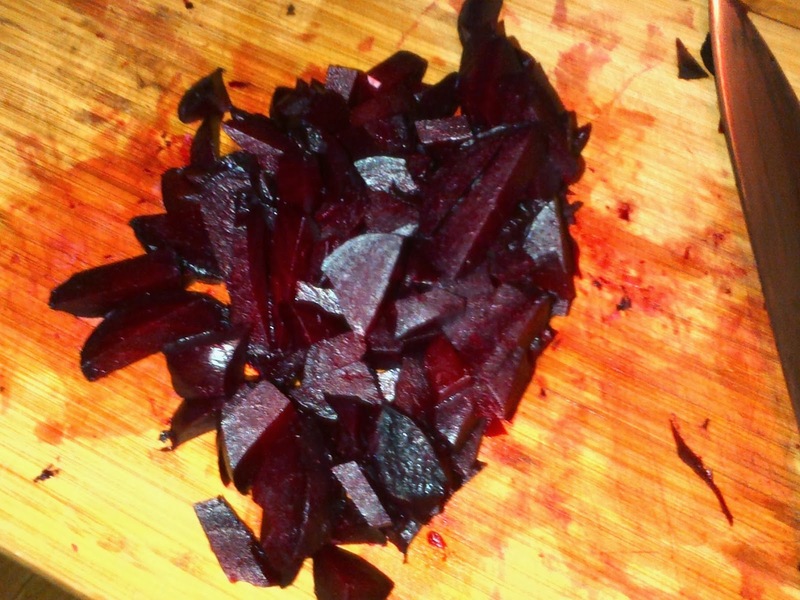 - Peel skins off beets (they should just slide off) and chop roughly. - While beets are cooling, in a large pot, heat 2 tbsp of oil. 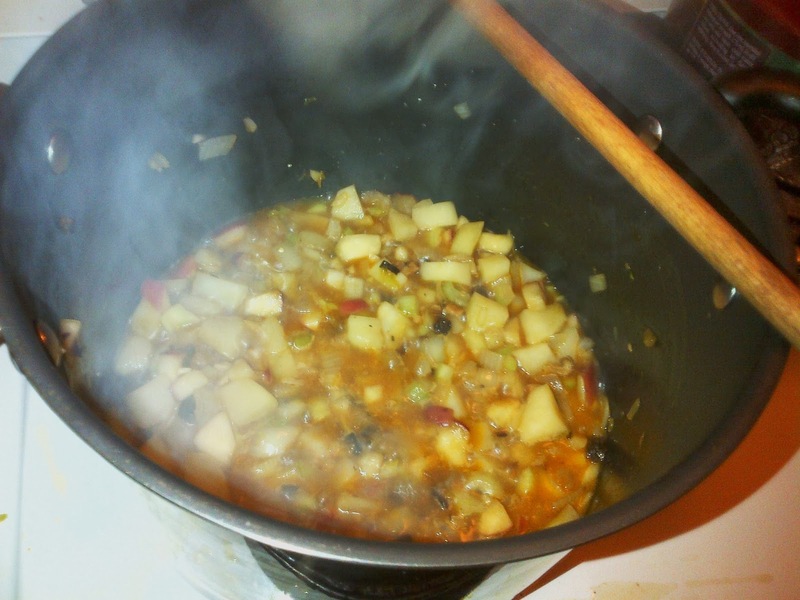 - Sauté potatoes, onions, garlic, mushrooms, apples and celery. 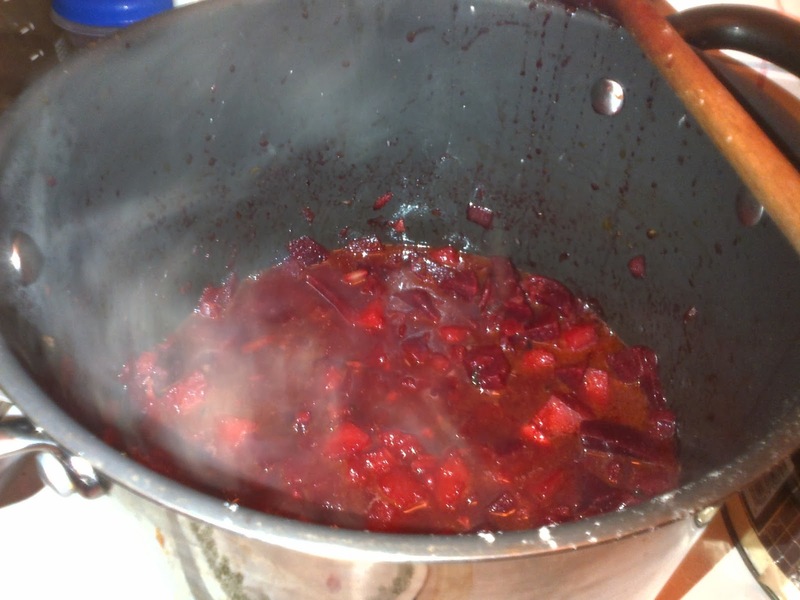 - Stir in stock and beets, bring to a boil and reduce heat to simmer. ... to delicious silky red! Just add beets! - Simmer the soup for 20-30 minutes. Stir in maple syrup and squeeze in lemon juice. - Simmer for another 10 minutes. - Using an immersion blender, blend soup until smooth. - Serve soup garnished with fresh dill and a dollop of sour cream/yogurt. 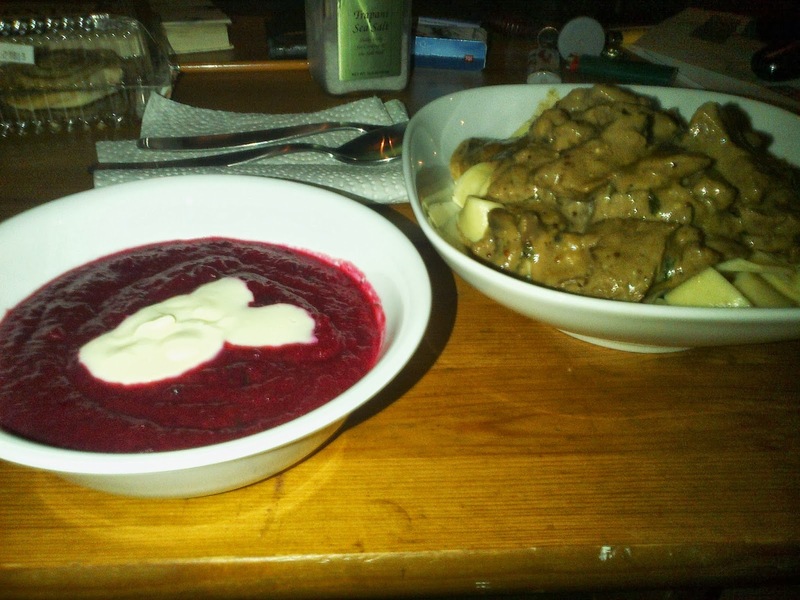 For the other part of the meal, we had Beef Stroganoff, but I wasn't as impressed with that as I expected to be. Regardless, here's the basic recipe I used/adapted (went with sirloin instead of tenderloin). My suggestion is to get a big ol' loaf of your favourite crusty bread or maybe pumpernickel and eat the soup with that. Probably less likely to cause a food coma as well. Preparing for hibernation? Here's your meal! 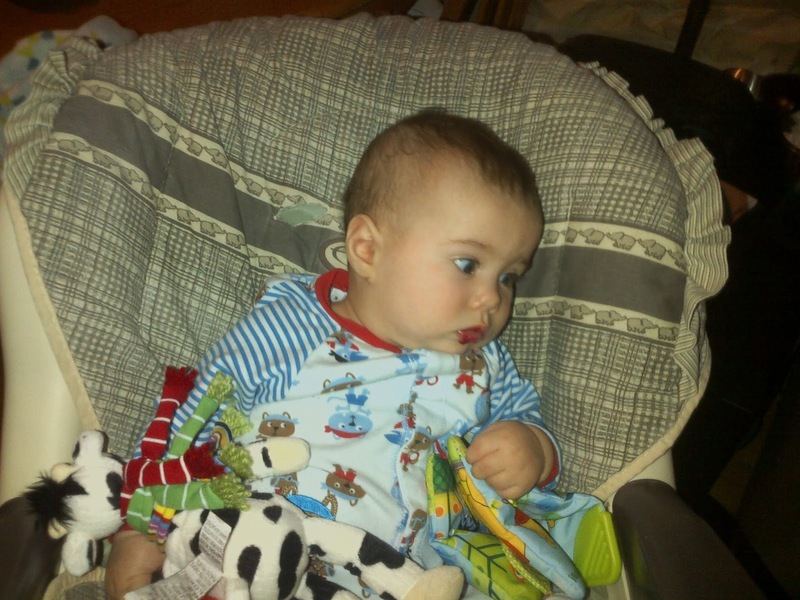 PS: If a 5-month old likes it, you know it's good!